Premier Tech’s tank adapter is one of the largest available. Some concrete tank’s existing openings are larger than the average 30″ tank adapter can accommodate. 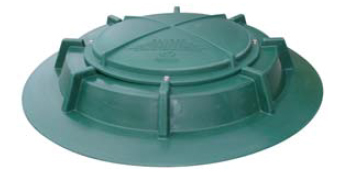 With a 42″ diameter round base this tank adapter is a solution where few can compete when adapting a larger opening on a septic tank. The raised center area is also excellent for adapting concrete tanks that have a raised lip around the opening.